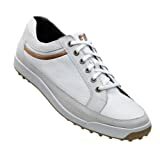 Constructed of proprietary M Spec leather by Pittards, the FootJoy Men’s M:Project Golf Shoes provide a thin, supple, comfortable feel. The P.I.N.S. spike system comes with thinner spike receptacles and Stealth cleats by Softspikes, and the ProTekt toe guard is designed to provide abrasion resistance in a key wear area. FootJoy Contour golf shoes are designed to be the most comfortable shoes you’ve every tried on – even from the very first time. They feature slip last construction (which is found in running shoes) and have a soft and flexible feel. 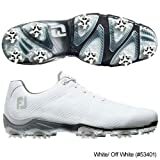 The Footjoy Contour golf shoes now have Flex Zone technology to allow the shoes to “flex” or contour to your foot for the most comfortable fit imaginable. High performance mesh uppers provide breathability and lightweight comfort. Designed to provide abrasion resistance in key wear areas. Full rounded toe character, full fit across the fore foot allows toes to spread and grip. The Laser Thin Duramax proprietary rubber compound provides low profile turf gripping power, while maintaining highly flexible. Super-Soft premium leather uppers offer outstanding lightweight comfort and durability. DuraMax is a proprietary rubber compound that provides turf gripping and performance and durability. Full grain leather uppers offer outstanding comfort, breathability, and durability. A shoe construction technique often found in running shoes. This unique construction allows a shoe to be made without an insole board, producing a more contoured underfoot platform and vastly increased flexibility. Slip last construction enables Contour Series shoes to feature contoured PU Fit-Beds that match the shape of the last and the midsole. This creates an underfoot base that more closely mimics the natural shape of the foot. Contour Casual footwear features the same world renowned fit and comfort as their cleated counterpart. The spikeless version has the added benefit of a spikeless outsole. Now Footjoy Contour comfort can be enjoyed on and off the course. 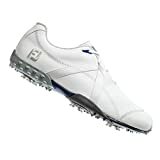 FootJoy SuperLites golf shoes deliver a performance ultralight feel with sporty appeal. 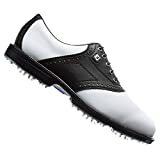 Constructed of proprietary M Spec leather by Pittards, the FootJoy Men’s M Project Spiked Golf Shoes provide a thin, supple, comfortable feel. The P.I.N.S. spike system comes with thinner spike receptacles and Stealth cleats by Softspikes, and the ProTekt toe guard is designed to provide abrasion resistance in a key wear area. PERFORMANCE LEATHER: ChromoSkinTM leather, developed by Pittards® of England, is a supple, lightweight and durable leather, offering two year waterproof protection. ATHLETIC DESIGN: The SnugFit tongue with MicroVentTM technology shapes to the foot while providing breathability. A 3D FoamCollarTM molds to the ankle for unsurpassed support, comfort and fit. EXTREME COMFORT: The lightweight cushioned Fine Tuned Foam (FTF) fit-bed provides optimum underfoot comfort and heel support. SUPERIOR TRACTION: The NitroThinTM TPU outsole provides lightweight stability and performance. Stealth Cleats by Softspikes help to achieve a low profile while the thinner spec receptacles ensure low-profile performance through the P.I.N.S. system. 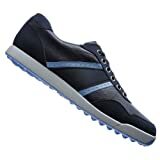 NITRO LAST: The Nitro Last offers a full rounded toe character, slightly shallow forefoot, slightly narrow heel and standard instep. The extra depth helps accommodate a thicker fit-bed for enhanced cushioning. Feel the flex! 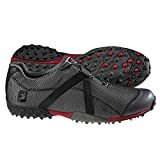 Special construction allows for the ultimate in underfoot comfort and flexibility.uppers, FootJoy Men’s DryJoys Golf Shoes feature seven individual Stability PODS surrounded by dramatically enhanced OptiFlex zones. The result is breakthrough flextability – stability achieved through maximum flexibility. The outsoles versatile flex points allow more of the shoe to maintain contact with the ground throughout the swing. Golf specific technology is why DryJoys continue to be the shoes of choice for serious players at every level. 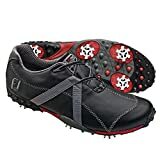 Find more FootJoy Golf Shoes products on Amazon!